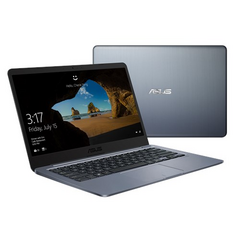 Although not yet available in market, the 14-inch Asus E406MA will be one of the few Asus laptops to carry Gemini Lake options. The Pentium N5000 can provide a multi-core performance boost of about 65 percent over the Pentium N3710 found on the older Asus E406SA. Move one step down from the Asus Vivobook series and you have the Asus E-series of inexpensive laptops often retailing for less than $600 or $500 USD. The 14-inch Asus E406SA currently in market ships with Pentium N3710 and Celeron N3060/N3160 options all from the aging Intel Braswell family. Fortunately, the Taiwanese maker is now ready to update the series to Intel's most recent Gemini Lake platform. As unveiled by its product page, the newer E406MA will carry Pentium N5000 and Celeron N4000/N4100 options with integrated UHD Graphics 605 or UHD Graphics 600 depending on the CPU choice. Integrated storage will be increased to a maximum of 128 GB compared to just 64 GB on the E406SA and Windows 10 S will be a new OS option as well. Other than the above, the E406MA appears to be just an internal update with no external changes to the chassis or its features. The same 1080p TN or IPS options remain as do the dimensions and number of ports. We recommend checking out the official product page below for more details on its hardware.